I wish to offer my gratitude to everyone who has so kindly assembled today on this auspicious occasion of Dussehra. Today all over the world there are millions and millions of people celebrating this day. But like most spiritual occasions not so many know why? – It is a characteristic of kali yuga that even very sacred things are perceived very superficially. Often times religious festivals of all religions are more of an opportunity for some sort of social entertainment than for genuinely cultivating Love of God – which is the purpose of every great religion and the purpose of every spiritual observance. The Srimad Bhagavatam tells “Shram eva hi kevalam” whatever occupation we perform whatever spiritual activities we do if in the end it does not awaken within us a deep attraction to hear about to chant about, to serve and to love God than we miss the point. We have wasted our time. Today Lord Sri Ramchandra is being remembered for his killing of Ravana. Interesting; just a few blocks away is the house of Mahatma Gandhi were he lived. In fact when the British police were coming to arrest him he came right onto this property and hid in the LaxmiNarayan temple, And the pujari locked the door from outside. And the soldiers searched this entire building even the room we were sitting in today. But they had no idea he was in the temple which was locked, apparently the deities were sleeping and he escaped. He is well known throughout the world as a proponent of non violent revolution. Not to resort to violence and he is also well know at the time of his death when he is assassinated he chanted the name of Ram, so ultimately Ram was his shelter. And how did Rama deal with situation, he killed Ravana. Is this a contradiction? We understand this principle that when the absolute truth who is perfect performs his pastimes it is all perfect. It is ultimately far greater than non violence. In fact it is ultimate perfection of non violence. An example, this example comes to my mind very quickly because I just had surgery one week ago and still the effects of it are upon me. If somebody has a very very serious life threatening disease and the surgeon cuts the person open with his knife, and then takes out the disease and kills it, is that violence or nonviolence? – Actually saving a life. But the difference is when the Supreme Lord, whatever He does is for everyone’s ultimate benefit. Ravana was liberated from the cycle of birth and death. Rama killed his ignorance, his illusion, his ego, and in doing so, He protected all the innocent people within the world. And also facilitated the whole world to protect their lives. So, Rama vijayotsava is the festival of Rama’s victory. His victory of love over hate, His victory of compassion over envy. A truth and light over illusion and darkness. Ravana was terrorizing this world. And he stole the consort of Lord Rama, Sita. But how Rama performed this wonderful act of liberating Ravana was a very very instructive, instructive in the sense that it really revealed the heart of the Lord, intimately. The Lord’s love for His devotees. Because at every step, Lord Sri Rama is giving credit to His devotees more than Himself; and even when He did something, He staged in such a way that it was due to the blessings of His devotees. This is a very important lesson, because what keeps us in this world is our very deep rooted tendency to take credit for what we do, to take credit for what we don’t do, to give blame for what we do – this is ahankar. that the bewildered soul under the illusion of false ego thinks him or herself to be the doer of activities. But actually, within this material creation, everything is being done by the influence of the three modes of material nature. And beyond that Krishna, the Supreme personality of Godhead is the controller of the material nature. So, we want to take credit, we want to give blame, but when the Lord descends in this world, He is very eager to give credit to those who are pure in heart. During the battle of Sri lanka, first of all just to get Sri Lanka. I am afraid to go back to the beginning. When Rama was searching for Sita, He knows everything past, present and future. He is in between every atom, the paramatma within the heart of every living being, there is nothing he does not know. But yet He is asking everybody, where Sita is? When He went to Kiskinda ksethra He made allies with Sugriva, Angada, Hanuman, and Jambavan to help Him to find Sita and then to help Him to rescue Sita. Does he need our help? Factually all of these vanaras or all of these monkey soldiers, they could only see, they could only hear, they could think, they could move, they could only live because of the power of God within them. He is giving them all power and then He is coming and saying, “I need your help.” Because the Lord is Rasaraja or let us say Rasabihari, we are in Bombay. He takes joy in loving relationships. So while He was in the mountain waiting for four months chanting Sita’s names and meditating on her in separation on His heart and meanwhile Sita the supreme Goddess fortune is in Ashok groves; at least Her expansion is there in Sri Lanka, apparently in present by Ravana. How is it possible? Then the various monkeys were searching and searching everywhere and Rama was just waiting, waiting and waiting and ultimately when they were giving proper direction, Hanumanji with one jump, he jumped 800 miles across the Indian ocean to Sri Lanka. And then with one jump, he came back after doing his seva. He gave Sita the message. He destroyed the Ashok Grove, which was the favorite place of Ravana, and then he met Ravana face to face and gave him, what he wanted to say, good morning. Then he burned the city down, at least, a vast portion of it. Then after jumping back, he came back and met Rama. Rama with tears of love embraced him. Rama told Hanuman that I am forever endeared to you for what you have done. And from Hanumanji’s side, he was one hundred percent absolutely certain that it was only by Rama’s power and grace that I could do anything. Its love, it’s the interaction of love on the spiritual platform. The Lord is giving credit to his devotee and his devotee takes no credit for himself, he is giving all credit to the Lord. Our tendency of friendship is we like to boast of what we have done to our friends, but real love is not like that. Real love is in serving, real love is in pleasing one another on the spiritual platform. So when Lord Ramachandra came to the shore of the ocean, now little later on in the next yuga He is going to reveal His Virat rupa, his universal form. Now what could Ravana do standing before that Virat rupa? And in the past he already killed Ravana in his past birth as Lord Nrsimhadeva. No problem, he already killed Ravana’s brother in his past birth as Hiranyaksha as Lord Varahadeva. So Rama could manifest those forms if he wants. What is the problem? But He is asking, “How am I going to crossover the ocean.” So Vibhishana says you should perform a little tapasya and ask the ocean. So He is sitting there for days fasting to get the blessings of the ocean and the ocean doesn’t come, personification of the ocean. So He is taking a very humble position. But He understands He is the paramatma in the heart of the presiding deity of the ocean, he was proud. So Lord Rama took one arrow and he just pulled it back and it created such heat that the entire ocean started boiling over instantly. Now for us to boil a pot of water it takes a few minutes to bring it to a boil. This is the Lord’s power, in a second he can bring the entire ocean to a boil. And the aquatics were screaming, and then the ocean personified comes out with folded palms and surrenders and says please forgive me. Whatever you want. And he says you can make a bridge over me. So Rama walked eight hundred miles on that bridge. Hanuman jumped over it in a few seconds, may be not a few seconds but quite quickly, very fast flyer. So Ramachandra walks with Laxman and Hanumanji’s one jump and when they get to Srilanka tremendous battle. One of the world’s greatest battles. At one time Indrajit came out to fight. 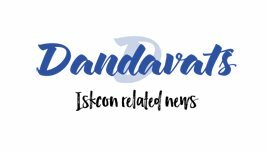 Indrajit is the eldest son of Ravana. Most powerful personality in battle. One Indrajit today could probably defeat all the armies in the world. Seriously, without a doubt. He was that mystically empowered. If Indrajit went to Kashmir, He would just say, since he was a crooked person, he would say, who is going to bribe me the best. Then that’s the end of the war. Very powerful person. So he was fighting against all this Rama’s armies and Lakshman, and he became so angry, that he chanted these mystical yogic mantras, started shooting arrows and from these arrows came serpents and the arrows completely covered Rama & Lakshman and they fell to the ground and they appeared to have lost their lives. And Hanuman and Jambavan & Angada and Sugriva, they were also covered by all these arrows. They were all just laying there, it appeared that they were dead and Indrajit was convinced that they were all dead and went back to Sri Lanka and told Ravana: “War’s finished, I have killed them, enjoy Sita. And Ravana was very happy, he told Sujata, who was, you could say, one of the caretakers of Sita. Bring her in a celestial airplane, show her how Rama & Lakshman are dead. And she did that, and Sita was weeping and crying. And Sujata said, actually they are not dead. Nobody could kill Them, it’s just a temporary thing. So meanwhile, while Jambavan and Hanuman are crying, they don’t know what to do. They are really crippled, Rama & Laksman just laying there completely covered by these mystical snake arrows. Suddenly a big wind is felt by everyone, then appears Garuda. And as soon as Garuda appears, he just flaps his wings and just gazes very angry at those arrows and immediately all those snake arrows just release Rama, release Lakshman and released everybody else and disappeared. And Garuda said to Rama & Lakshman, he said those, by his mystic power, Indrajit was able to invoke the sons of Kadru to appear: these snakes as arrows. But because they are afraid of me, just by my presence they all went away. And through the battle Lord Ramacandra was always getting advice from Vibhishan how to deal with certain situations. When they were fighting with Ravana, Ravana, he was so angry with Vibhishan, he wanted to kill him. He started battling against Vibhishan. And Vibhishan really didn’t have a chance. So, Laxman came in between them and started fighting against Ravana. And every time Ravana threw some javelin or shot some arrows at Vibhishan, Laxman would come and intercept and destroy them. Ravana was so angry. He turned all his wrath against Laxman. And he had a deadly javelin for the worst possible battle. And with all his might, he threw that javelin towards Laxman and it penetrated his armour, pierced his chest going deep into Laxman’s body. Laxman fell to the ground. Rama ran to him and appeared he was lifeless. Lord Rama immediately started fighting against Ravana. He has Hanuman and some others – “You take care of My brother. Let Me get rid of this ten headed monster.” He fought, and ultimately Ravana had to retreat. Ramacandra placed Laxman’s head on His lap and saw this wound. It was unbearable to see. And the Lord pulled the javelin out of Laxman’s chest and broke it into two and threw it aside. Meanwhile Rama is speaking to Lakshman and speaking to everybody who could hear, that even if I win the battle there will never be a life of joy again if Lakshman is dead. Ram was crying and everybody was watching him. It was a lila in which the Lord is invoking of such essence in people hearts and Susena said in the Dronachala which is a mountain range in the Himalaya, he said on that mountain a herb called sanjibani Karani.If it is brought back here before the sunrise I may be able to save his life otherwise it is not possible. Now even with today’s best technology who could do that Hanuman said I will do that, the sun won’t rise. If I don’t got back here in time, I will eat the sun, that’s not going to rise and he jumped all the way to Himalayas from Srilanka. He got to the mountain and there are so many herbs in the mountain. And he was thinking If I go back and it’s the wrong herb I am not going to have time to go back all the way searching for another one .He was so thorough with his service attitude, so completely without ego. When you have an ego you are limited to your own strengths and weakness. But because he was totally surrendered to Ram nothing was impossible for him. He had such enthusiasm. we were hearing yesterday about enthusiasm. Hanuman what enthusiasm, he uprooted the entire mountain and lifted it up.In the meanwhile Ravana was sending all kinds of demons to stop him and he was fighting them off carrying the mountain and Bharat even saw flying him over Ayodhya and tried to stop him. Not without obstacles but for Hanumanji there was no question of may be or if. He committed his heart to his service. When Prabhupada was going in ocean over Jaladuta there was no may be or it is. He was going to do it, he was going to execute the order of Lord Chaitanya and Gurudev whether he lived or died was a detail but he was going to do it. Such a service attitude. Hanuman crossed oceans, Prabhupada crossed ocean for the same purpose to rescue Sita, Sita’s devotion and with in all our hearts the Sita of devotion is in the Ashoka groves of Ravana representing lust and envy and anger and pride and illusion Maya.Prabhupada crossed oceans and took great risks to restore that devotion within our hearts ,to bring our soul back to Ram. So Hanuman brought the mountain Gandamadana Mountain and set it down and Susena came and cut the herb and Laxman woke up and stood up. At that point Rama decided this is the end of Ravana. He has done this to my brother. Now in the mean while Rama just crying helplessly, what to do about my brother and how Hanuman the one who goes and saves. Saves the situation. And again the same dynamics of relationships. Hanuman is not thinking, just see, I can do but god cannot do. (laughing). What to speak of same thinking? Just see, I am god. In one of my plenary portion as Rama Chandra, He could not do it, but can do. Hanuman was absolutely humble that my lord, in his heart whatever you make me do, I am doing. Actually in Srila Prabhupada’s prayers in Jaladuta, we are given the essence of every pure devotees heart in all of these different beautiful scriptural pastimes. Srila Prabhupada was praying to Krishna “I am your poppet. Make me dance as you want me to dance”. That was Hanuman, he just felt himself to be Rama’s poppet. Rama wanted to give him all the credit. Hanuman foot ever famous for lifting that mountain. That is Hanuman’s love for Rama and Rama’s love for Hanumanji. At that point Lord Ramachandra said that now the world know, whoever hears this either Ravana is going to dead or I am going to be dead. Today his life will end and anyone who hears this glorious narration is going to be liberated and the story of this battle and my killing or Ravana is going to be song as long as creation exists. That was a great battle. Again Lila the lords like to make things exciting. Actually He is the paramatma. What could Ravana may do, If paramatma just, you know the Sudarshan Chakra and said it, cut the everything of inside it. Lord can killed everybody in any way effortlessly. Mahavishnu he just go, in one inhalation in entire creation destroyed. Mahavishnu – to do is just go – Ravana will go finish form inside, outside and anywhere. What a battle? The reason of battle was of the nature that appeared for so many reasons. We can just get glimpse into flew of them. He began to include all these devotees, who like to fight the monkeys in the battle. They were all risk in their lives. Some of them are getting killed for the shake of the Lord. Some of them are performing most unbelievable – activities in the service for the lord. Most of all they were all totally all these hundreds, thousands, and millions of soldiers where in Rama’s army, they were totally united in the service of Rama Chandra. Totally united fixed in their consciousness in giving relieve to Sita. That’s beautiful. Similarly the Lord, He has given all His devotees this mission of being united to work together, to help each other overcome illusion and to help save the world from illusion. 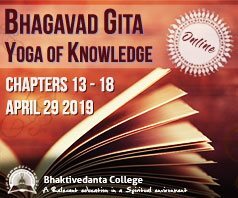 Someone once asked Prabhupada, Lord Caitanya, He predicted, Nityananda Prabhu also: That the Holy Names will be chanted in every town and village all over the world. Why didn’t He do Himself and Bhaktivinode Thakur was such an Acharya, he was talking about it, Why didn’t He do it? And Srila Prabhupada said, they could have done it themselves, but they wanted to save the service for us. And what does that mean? In this battle against Maya, for our own purification, the fight is what purifies us and when we understand how much we need each other in this fight, then we rise above all our petty, superficial egoistic differences and we unite for the higher cause. This is the Lord’s love, to help us and the Lord takes the greatest pleasure when He sees that we are doing things that are good for us. So Yes this massive battle was going on. And Ravana appears on his magnificent chariot and Lord Rama is just standing on the ground with his bow and arrow and Indra sends his charioteer Matali, he comes down and says I am Matali, and Indra sent me, this is his chariot, this is his bow, this is his arrows. Come, let us fight together, so in this way Lord is engaging so many other people and all the other people who are helping Him, they are serving. But they are serving in a deep emotion, because they are serving with a sense of need. Hanuman’s bringing those Sanjeevani herbs, Yashoda’s giving her milk, Indra sending his chariot. Deity worship: it’s with this same type of consciousness. Krishna is the Absolute, Krishna is Supersoul, and ultimately doing everything for everyone. Atleast He is empowering everyone according to their free will. So, why we are cooking? Why we are dressing the deities? You know it’s a common thing that a person who is materialistic, comes to the temple, and they say what’s going on in the altar and they say they are dressing God, and the person will say, can’t God dress Himself? It’s typical question, I have heard it so many times. Cooking for God! God needs somebody to cook for Them. Yes, bathing God; I am not God, I can take my own bath? But yet God actually is in a position where He is in need and Radharani is in need. They are in need, because they want to exchange our devotion. Because that sense of need increases our feeling of devotion. And it’s not just an imaginary thing to increase our devotion. It’s something very real. They are actually hungry for our love, if it’s done with devotion. In Vrindavan, even very very special guests sometimes will come to the temple. Prime minister or somebody who is willing to give crores of rupees of donation – they come to the temple, they have to leave in one hour, they want to see the darshan. And the pujari says, “Krishna is sleeping.” – “When does He wake up?” – “He wakes up at 5’ o clock in the evening” “But I have to leave. Its only 1 o’ clock. I have to leave at 3. Open the doors” – “open the doors? Krishna is sleeping. I can’t open the doors.” Materially it doesn’t make so much sense. But Krishna actually is sleeping. Although Krishna never sleeps! Krishna never sleeps, but He goes to sleep. That’s why He is God. You can’t do that. He can be fully aware of everything, everywhere at all times, and at the same time He can go to sleep and not be aware of anything. Why does he do that? It’s a way of exchanging love. The pujaris in Vrindavan – that’s their love. Krishna is sleeping. And no matter what. We are not going to wake Him up until He wants us to wake Him up. So, when we perform deity worship, we understand that this is the beauty of lila. In the story of Gajendra, Srila Prabhupad writes in a purport, that Lord Visnu touched Gajendra when He pulled him out of the water, when crocodile was biting into him. Because of that touch, he purified Gajendra. He completely purified him by that touch. And Prabhupad said, similarly, the Lord allows Himself to take the form of a deity in which we can touch Him. And just by touching the deity, we can be purified just like Gajendra was touched by the Lord – if it is with proper devotion, if it is with the proper service spirit. This is how kind Krishna is to us. So, now, Rama is on the chariot of Matali with chariot driver and they were fighting and fighting and fighting and what a fight it was? There are pages of pages of descriptions of what they were doing to each other. They were showering each other with all kinds of mystical arrows and javelins and all kinds of other things. And sometimes, Rama’s body is covered with arrows and nobody could see Him and at other times, Ravana’s body is covered with arrows and nobody could see him; and sometimes they were crashing their chariots against each other’s chariots. Ultimately, this fight went on for days and nights continuously. And can you imagine the emotions of all the devotees? Rama could have killed them in a second. But He just staged this fight that just went on for days and nights. To increase our emotions, our suspense, our love, its really amazing because we know that Rama is infallible. He is acyuta. We know He is going to win. But still, I have seen, when devotees read about this battle, they are weeping, they are crying, they are trembling, their hairs are standing on end. It is more real than anything real. This is how Bhakti works. The Lord .. certain stages in certain ways to have the maximum effect of purifying our hearts and invoking thise emotions of realizations of love and surrender. Like the deity – a pujari, a real pujari worries about the deities. I remember being a pujari myself, when sometimes, the temple was being attacked, attacked by people who wanted to destroy the deities, destroy the devotees. And although we know if Hiranyakasipu can’t destroy Krishna, then what these little dacoits of kaliyuga are going to do to Krishna. If Ravana and entire rakshasas army could not harm Rama then whats you know dacoits can do to Krishna. But still because he is putting himself personally on being depended on us, we feel it and we have seen devotees risking their lives ,giving their lives to protect the diety and going back to Godhead. Because in this form Krishna is fecilitating this relationship of love. At a certain point Agastya Muni appears before Ramachandra and reminds him that I have given you an arrow and use that arrow and he gave him a mantra the AdityaHridaya mantra to chant with that arrow.Meanwhile the fight is going on and on and on and Ramachandra “Its time to end this Ravana’s life”.He took a Special razor sharp arrow it sored through the air and chopped off Ravana’s head.Now sometime Ravan on the battle field had all ten of his heads but usually he had just one. I guess its easier to fight like that. But he was mystical he can change his form ,he can become a one headed sadhu if he wants .But most of the time he had two arms and one head but sometime twenty arms and ten head.But Ram cutoff his head. And all the Hanuman, Jambaban and all the banaras “Jai Ram Jai Rama”, “glorious Ram”.Ravana’s head falls to the gound but instantly “another head” and the other head is exactly a replica of the one in the ground.soon there was a hundred heads laying on the ground.And every single head was a replica of all the other heads.They all had crowns,they all had jewels ,they all had the same eye, same complexion. And still Ravan was still fighting with the heads.He did not stop fighting as his heads were falling off.He kept fighting. Ram began to speak he said this arrows of mine they the same arrow killed Maricha killed Khara and Dusana, same arrow killed Viradha same arrow went through the seven Tal trees,same arrow made the whole ocean boil over and now I can not kill Ravana with the same arrow.Bibhishana revealed to Ram , “that within the heart of Ravana there is nectar ,celestial nectar, Brahma gave him the benediction that whatever heads and arms are cut off that are going to come back, the only way to kill him is you have to shoot an arrow into the core of his heart and that arrow has to dry up that nectar then he will not survive,anything else done that nectar will keep him alive”. And Matali reminded Ram that you have the Brahma arrow with you. Would you like to hear the history of this arrow .After Ramachandra,Sita and Lakshman left Chitrakut they were wondering through the Dandaka forest and eventually they came to the asrama of Agastya Muni.Now on the way Ram was glorifying Agastya Muni. He was telling them the story of Agastya Muni’s great power. And one of the stories he told that there were two demoniac cruel Rakshasas, they were Vatapi and Allvala story two demoniac story they Had a uniqye way ofkilling and he entered into food by his mystic power as a brahmana and he did invite other very very nice brahmanas to his home and said I want to feed you Prasad. And he fed up them Prasad but little do they knew that Vatapi was in that Prasad in very mystical little form and the brahmana were eat it. What a nice Prasad? The Illavala said Vatapi come out. And then Vatapi will grow inside and just with his claws and everything just like a ran just force himself out of it break up the perosn’s belly and stomach and tears the person apart from inside out. The brahmana’s body will be totally mutilated in dead. They did this to thousands and thousands of brahmanas. So we have to be very careful who we accept prasadam. (laughter). So one day they invited Agasti Muni for lunch and they fed him Prasad. Then Vatapi was inside his belly and then Illavala said, Vatapi, Vatapi come out. The brahmana who ate Prasad said, what he talked about? This is Vatapi. Vatapi come out, come out. Vatapi did not come out. Then Agasti muni said, by my digest juices I completely digested him. My god, such digesting. He digested Vatapi. He killed him. So the Illavala was really angry, you killed my friend. So he attacked Agasti Muni. He does not nonviolent, he just glanced at him. And for his glance Illavala became on fire and died. So Rama was telling this story. This is the power of Agasti muni. They went to his ashram and Agasti Muni greeted them and Rama, Sita, and Lakshman knowing him to be a great vaishnava devotee, they served Agasti Muni with so much loving devotion. Rama was asking Agasti muni philosophical questions. He was asking him stories from the puranas. 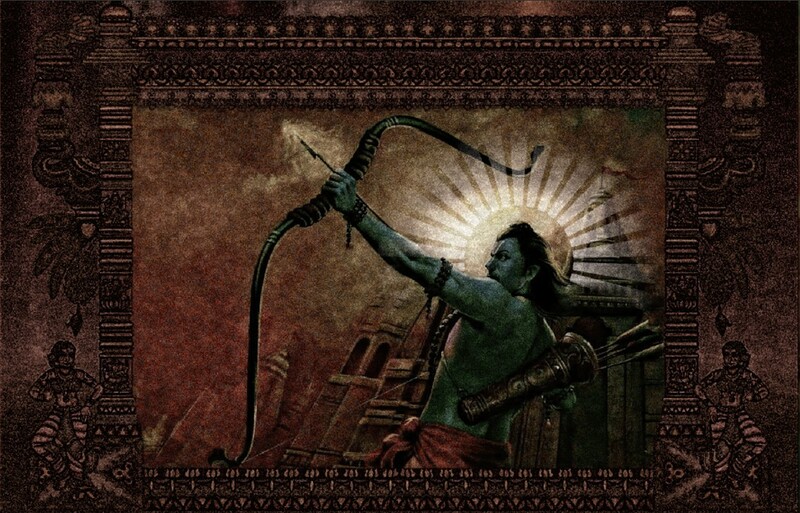 He was asking his advice and guidance and ultimately Agasti muni understood Rama’s, he could see the dangers ahead and he gave Rama a very special arrow. He told him previously this arrow was created by Lord Brahma and was giving to Indra to fight with the ashuras. And this arrow which was infallible was entrusted in my care and I am giving you this arrow today and used it at the greatest time of need. And he also gave him the mantras to make the arrow affective. Rama Chandra in his heart of heart, he remembered Agasti Muni with gratitude, took his blessings and then pull the arrow back. That arrow it shaft was predominated by bayu, it’s feathers were donated by garuda and the tip of the arrow was presided by the sun god, Surya with Agni. When Rama pull back that arrow, the arrow became totally effulgent. The whole world began to tremble, when he released it. It made such a sound more than any rocket chip. It was a beautiful sound, tumultuous sound. It lit up all directions. Everything in the entire battle field stopped. And all the millions and millions of soldiers and all the devatas who are watching, they were fixed simply on watching this arrow sored through the air. It hit its target – right into Ravana’s chest, pierced his heart, dried up whatever nectar was there. Ravana vomited blood, he screamed a ghastly sound that shook the world and fell from the chariot to the ground, dead. Very symbolic! Lust, envy, anger, pride, greed, illusion – they are personified. Ravana is the personification of these anarthas. They are not easily killed. You could be a devotee for one year or forty years or fifty years or sixty years. And you may find that every time you somehow or other restrain your mind and senses, from giving in to these anarthas, they keep coming back. The holy name is like the arrow that can cut off the heads of Ravana. We are chanting the holy names. When you chant in that spirit, the holy name actually goes right to the heart, removing all these anarthas. If we could take shelter of the holy name, if we could chant the holy name without offenses, in a humble state of mind, really like that baby crying for its mother, then the arrow, the holy name will forever remove these anarthas from our hearts. And the path of bhakti is simply to cultivate the proper consciousness in which we could chant the holy names. Ravan was dead. The nature of this we world is – one person’s happiness is another person’s sorrow. The rakshas were weeping, crying, angry. And the monkey soldiers were dancing in ecstasy. Then Vibhishan went to Ravana, got on his knees in front of Ravana’s bloody body and cried incessantly. He was speaking to his brother, “you had so many good qualities. You had so much good fortune. You are so victorious in every way. Wahy did you give in tyo lust. My whole life, I was your friend, I was your brother, I was your well wisher. Why didn’t you listen? Now look! The whole dynasty is finished, your family is destroyed.” And he cried, so disappointed! Rama told Vibhishan, “You should perform the last rights to your brother to liberate his soul”. Vibhishan had a hard time with that instruction. “He stole Sita from You. He did so many horrible things that caused so much pain to so many people. This is hard for me to do this.” Performing last rights is basically worshiping the person. Rama told him that the soul is pure. The soul is all good. It was only his body and mind that was corrupt and sinful. But now his soul is separated from that. There is nothing to fear from him. You should liberate his soul and perform the lat rights. Rama told Vibhishan to forgive his brother for everything. In fact, Rama said, because you are my intimate brother and he is your brother, he is my intimate brother too. Whatever reason we had for quarrel is finished. So, offer him your love. There is no impediment. So, Vibhishan organized the last rights and offered prayers to deliver his brother’s soul. That’s how Rama taught us forgiveness. He was seeing the disease, not the diseased. He loved the person, but hated the disease. When the disease was removed, all there was is the love for the person. Mandodari and the other wives were weeping and crying. But Mandodari was so honest and so knowledgeable. In many ways, her words to Ravana are instructions to all humanity. We all have so much. We all have such opportunity. Why do we waste it all by corrupting ourselves by giving into these vices? Ravana was a Brahman son, he was wealthy, he was powerful. He had a beautiful, wife, wise, chasteful, he had everything, and more than what everyone could want. But he was envious of God. And he fell victim to his lust. And because of that, he lost everything. Similarly we are all pure spirit souls. And we have all possible opportunity to attain supreme perfection in our lives and be really happy. We have unlimited spiritual wealth within us. But the down fall – is we give in to our mind and senses’ demands – lust, envy, anger, pride, greed, illusion and how they could destroy our lives. How we could loose everything we had. How we could we loose all these most precious opportunities? And as devotes we are given so much warnings just as Ravana. How important it is to take these warnings seriously. We see it all around us even in this world, of how giving into these powers of maya, can devastate a person’s entire life – materially, socially, spiritually. Mandodari is speaking to Ravana, is speaking to all of us too. Because we all have thise Ravanas within us. The good dog and bad dog. Rama is speaking, Ravana is speaking. We have the choice. And this day, Rama vijayotsava is the day we meditate and commit ourselves to following Rama. By taking shelter of Rama, by liberating ourselves from this Ravana within. And if we can just follow Srila Prabhupad and our acaryas’ guidance, it is guaranteed. In Treta yuga, the Absolute truth appeared as Ramacahdra. In Dvaparayuga, as Sri Nandanandana Krishna along with Sita and Radharani. Kali kale nama rupe Krsna avatar. In the age of kali, the Lord appears in His name. If with a proper service attitude, if with the spirit that the acaryas taught us, we can simply chant the holy names sincerely, without ulterior motives and serve sincerely without ulterior motives, hear these beautiful pastimes in that spirit, then real victory will be ours. In this spirit, we take shelter of Krishna’s holy names.